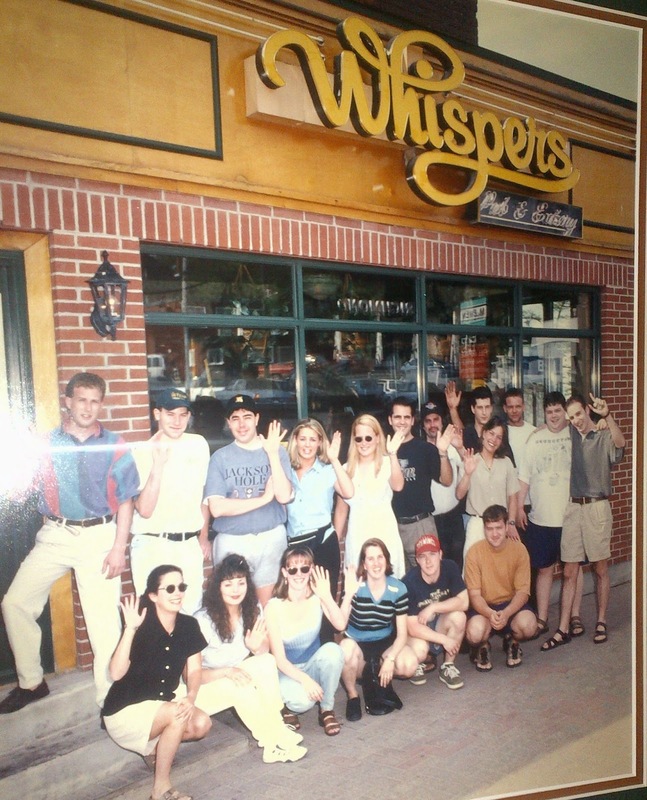 The evolution of Whispers: Westboro's Friendliest Pub - and one of it's oldest buildings! A pub like Whispers is exactly what makes Westboro so great. 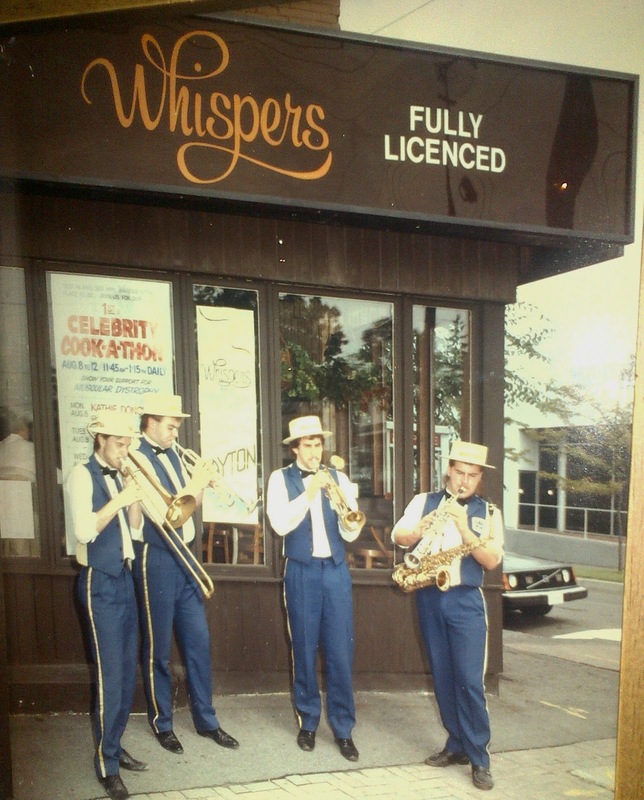 While I'm not a big drinker, I can't appreciate enough that a place like Whispers has been able to survive for so long. 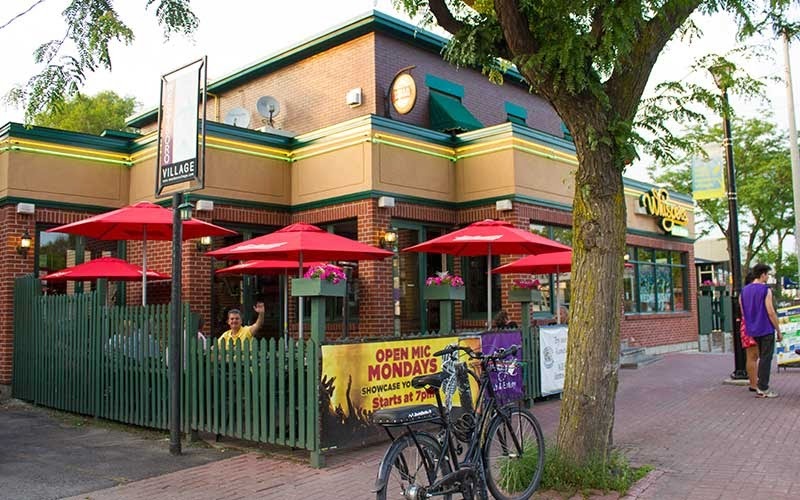 It's a place where anyone in Westboro can go and enjoy whatever kind of evening they like. You can hear a live musical act, watch a game, or play trivia; you can bring a large group or party in and have a loud evening, or you can have a quiet chat next to a fireplace. The reason it probably has been able to survive all this time is that it is not pretentious in any way. And it appeals to the wide clientele base that now inhibits Westboro. You can be a sweaty sports team after a summer ball game or a late winter evening's hockey match; they'll be glad to have you. You can be a businessperson bringing a client for a working lunch, they'll be glad to have you. You can be in your teens, or in your senior years, and there is a bar chair or table ready for you any time you like it. The patio is great too, if you can find a spot. The staff is always incredibly nice too, and will be as hand-on (or hands-off) to suit whatever you like. The atmosphere is laid back, and they don't try too hard. To me, its a perfect pub, and I'd be devastated if I ever heard it would be closing. A few years ago they even improved the decor by adding a lot of historical artifacts and old photos of a local interest. So really, what more could you ask for? It was natural then, that I set out to cover the history of the pub. I've been going through those front doors practically my entire life. Through family dinners, hockey team celebrations, hockey pool draft nights, dates, and eveningss where its just somewhere comfortable to go, Whispers is easily one of my favorite spots to be, And again, not that I'm that much of a barfly, but I've been in there enough times to know the layout of the place like the back of my hand - where every photo is and what its of. But as a history-curious guy, I've always wanted to explore the history of the building more. My interest was picqued years ago when I noticed that, hey, wait a minute, if you look at it from the street, it clearly used to be a house. They when you think about the interior, well sure, you can imagine it being a house! When they opened up the second floor a couple of years ago, you almost felt like you were heading up to the bedrooms! So with this blog, I now have a completely valid excuse to really delve into the the past, and find out the whole back story of the pub. 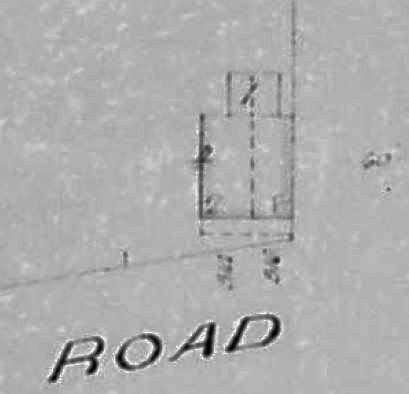 I knew bits and pieces already, but it was really worth digging deep in to records at the land registry office and the city archives. 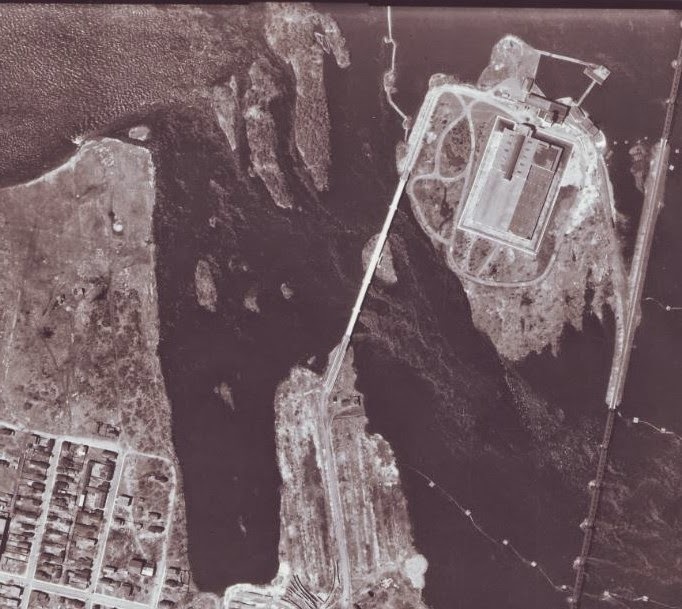 To start off, Westboro itself started life essentially as a small village supporting the local mill located by where Westboro Beach now exists. The village was even named "Skead's Mill", after its owner. After the mill closed (and later burned) in the 1880s it took a while for the area to grow. 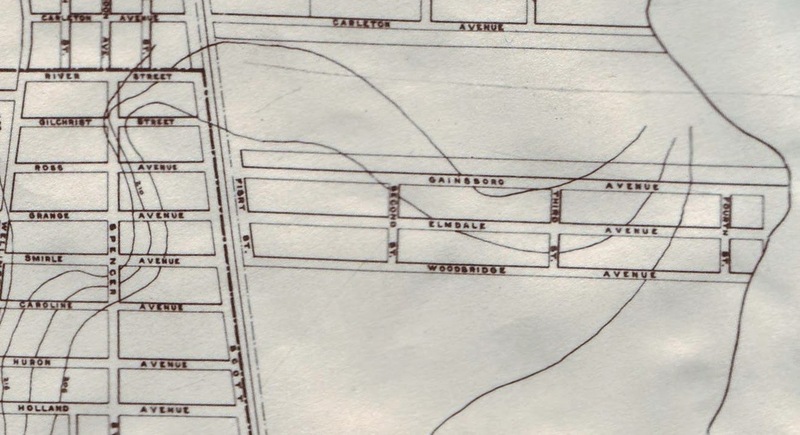 Thanks to the arrival of the trains, and in particular the streetcar line to Britannia, Westboro became a desirable location for Ottawans to live and commute. Once the automobile arrived, there was no looking back. 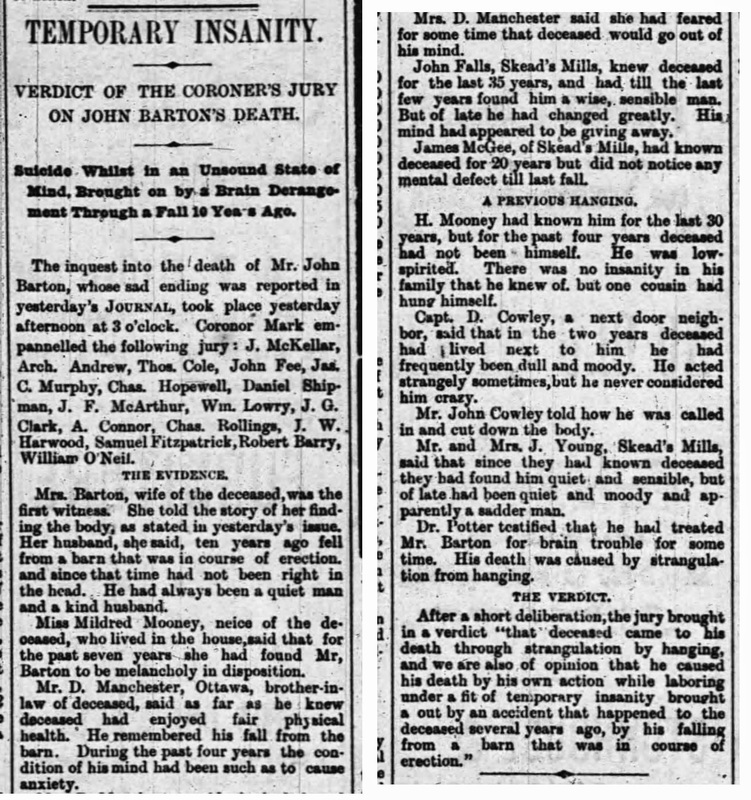 By 1910 the Westboro population was just around the 1,000 mark, and many of the former farmers were finding that they could sell their property for many times what it was worth only twenty years prior. Some took it upon themselves and created subdivisions of their own. 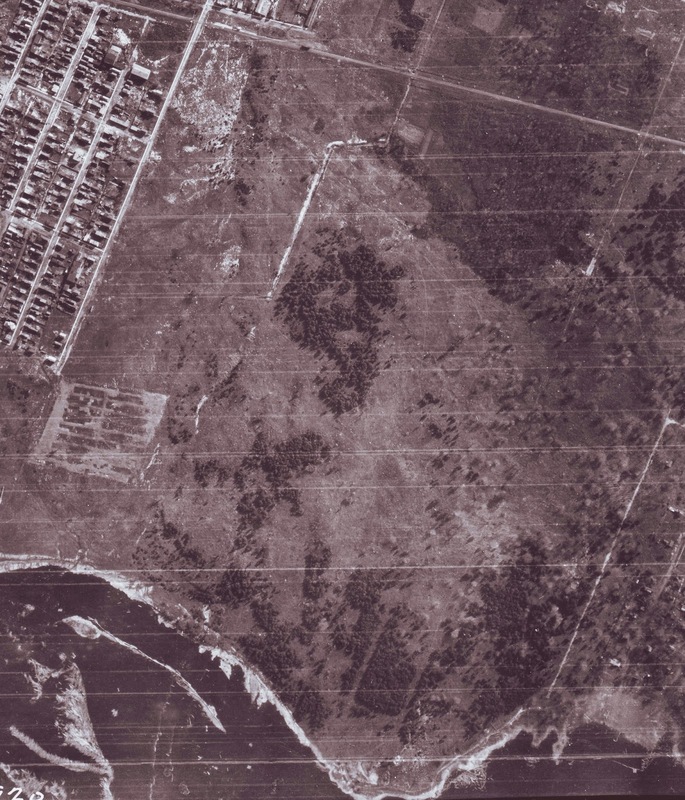 Others sold it off in blocks, and real estate prospectors bought up land as investments. F.X. 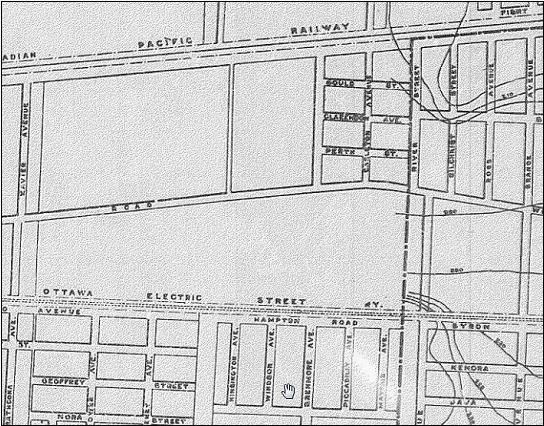 Ladouceur was one such prospector, and I detailed his 1909 "Mansfield Park" plan in the history of Tweedsmuir Avenue article. 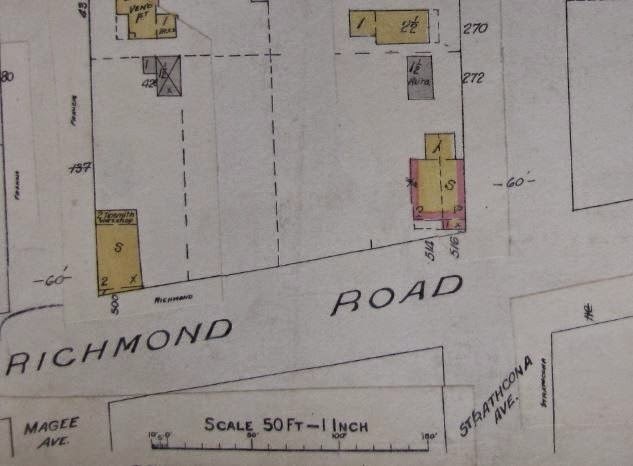 sale deed for lot 6, Richmond Road. The southern edge of that plan was Richmond Road, and those naturally were the most sought-after lots when they hit the market. 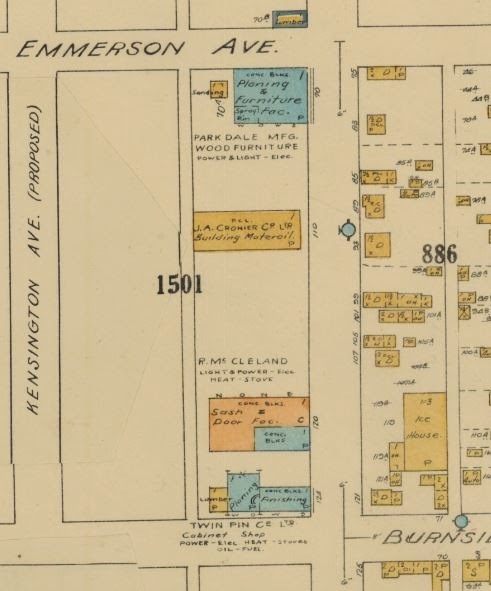 On November 7th, 1910, Laderoute sold lot 6 at the corner of Richmond Road and Xavier Avenue (now Tweedsmuir) to Mary Margaret Larkin for $600. Mary was the wife of carpenter William Larkin (it was common in the era for real estate transactions to be put under the wife's name). 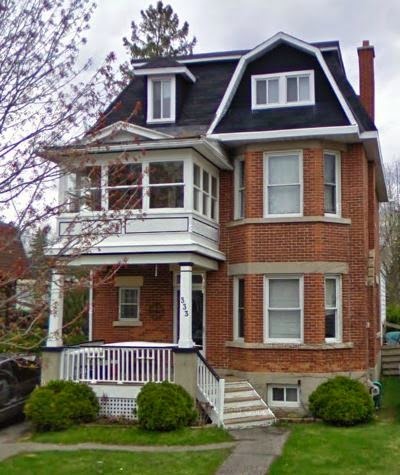 The Larkins, who resided downtown at 112 Percy Street, financed the purchase with a mortgage of $650, which likely just covered the purchase and perhaps some immediate foundation work at best. 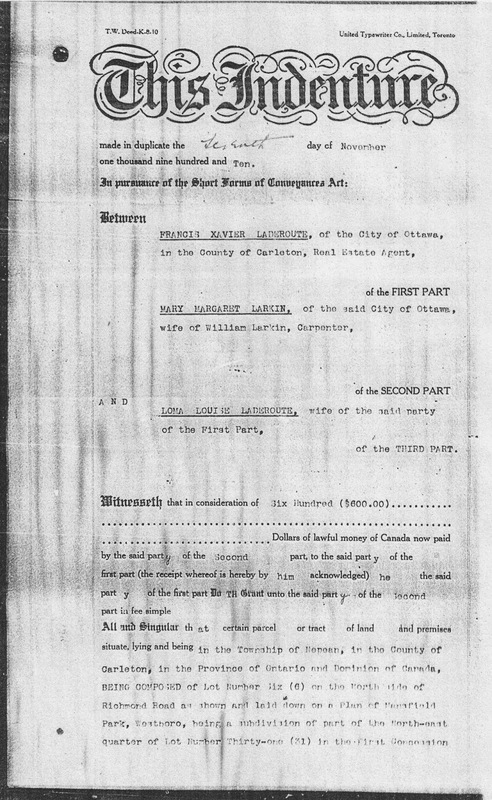 In February of 1911, a second, larger mortgage was taken out from a Mrs. Marie Davieau for $1,050, for the construction of the house. The two-storey, wood-frame house was completed quickly. The Nepean Township assessor visited on April 21st and noted that the family was occupying the home. They had also made it just in time for the 1911 Census of Canada, which was taken on June 1st. 21-60 years old, and "Apr 21" being the date of the assessor's visit. Photo at left of Mary and William Larkin, the builders and first occupants of the future Whispers pub. 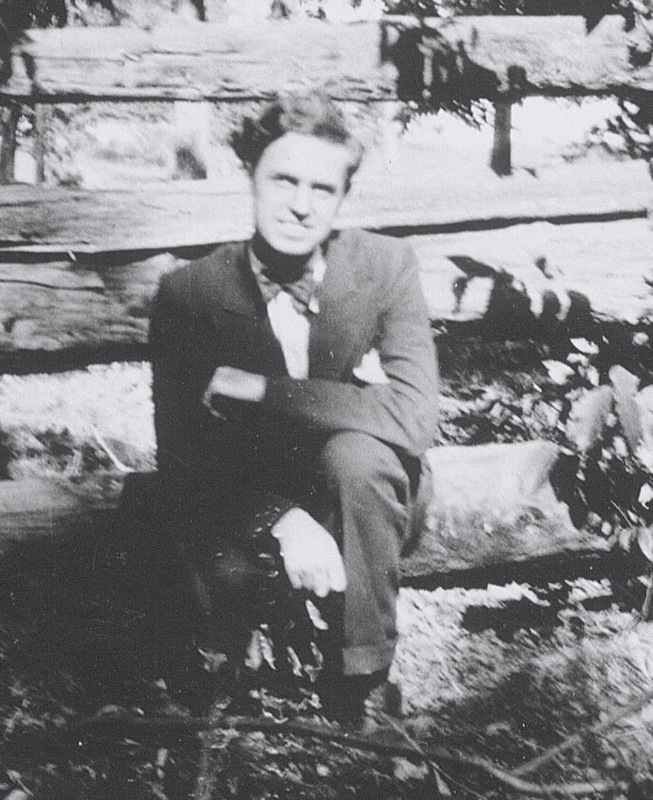 William Larkin was also responsible for the construction of several brick homes in the Westboro area as well, according to his grandchildren. Signalling that work was progressing on the house, the value had increased to $600 in 1912, and then once it was bricked in 1914, had increased all the way up to $1,800. structure of the Larkin house. Construction costs had added up, and so by 1915 the Larkins took out a new mortgage for $2,500 from a David McCaffrey (it was very common in these era to acquire a mortgage from an individual lenders, not necessarily the bank). Within a year the mortgage was re-assigned by McCaffrey to John F. and Bessie Dowling. This would later be an important detail. 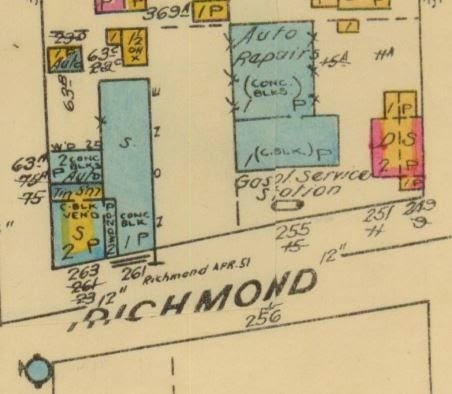 The house appears to have been initially designed as a duplex, the dotted line in the 1915 fire insurance plan (at right) indicates a partition wall. As well, prior to housing a business, the building had two civic addresses (at the time, #514 and 516 Richmond Road). It was about 1919 that William Larkin added on a small addition to one half of the front of the house, with the intention of opening a small shop (the change is visible when contrasting the 1915 and 1922 fire insurance plans, see below). 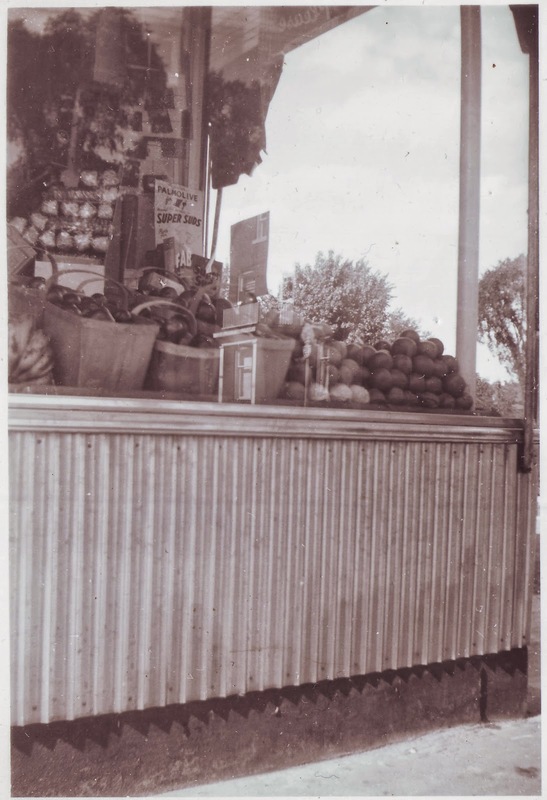 By the early 1920s, Westboro was prospering, the area was growing quickly, and the Larkins had a successful grocery shop business underway. 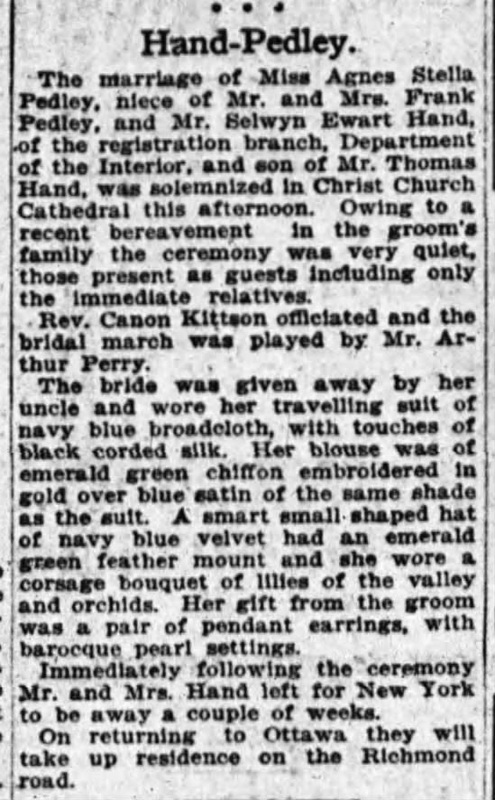 William and Mary Margaret (formerly Rooney) had five boys: Earl, Roy, Matthew, James and Daniel all between the ages of 8 and 18 in 1921. In fact the youngest son Daniel, actually was born in the upstairs rear bedroom in 1913, according to his son Patrick Larkin, who very kindly aided me in putting some of the details of the early days together. Richmond Road, wood frame (yellow colour), with brick veneer (pink). perhaps originally constructed to be 2 semi-detached residences. On the 1921 Census, William continued to be listed with the profession of "carpenter" (with an annual income of $700). The house was described on the Census as a 7-room brick-veneer single home. 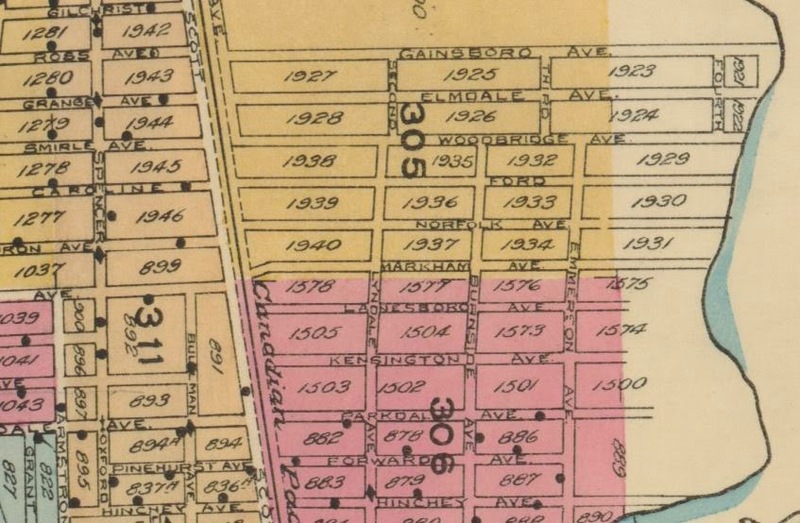 The 1922 fire insurance plan shows the vastness of the area at the time, and the future Whisper's building was the only structure at the intersection of Tweedsmuir (by then known as Strathcona) and Richmond Road. 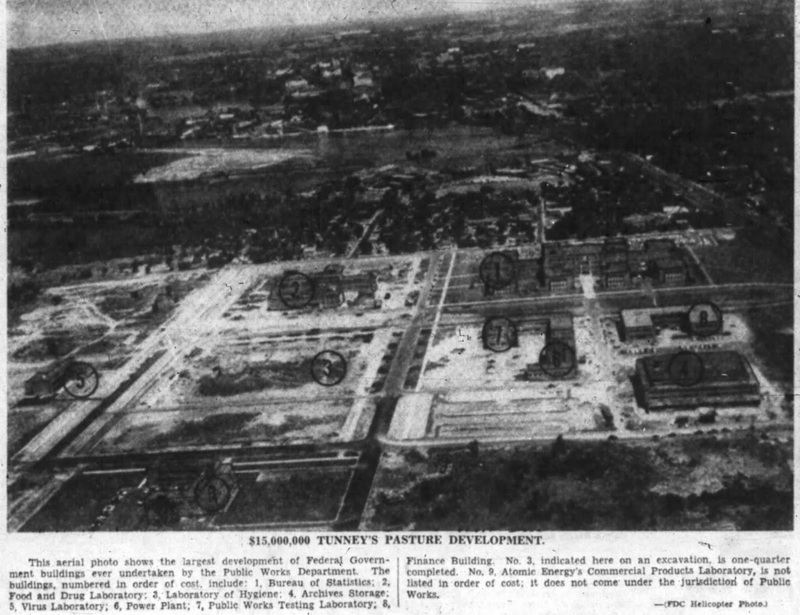 The civic number of the building changed in the mid-20's as well, and was given the number 9 Richmond Road for the business, and 11 Richmond Road for the residence portion (the numbering was based on Richmond Road starting at Tweedsmuir, which was the eastern border of Westboro. Prior to Canada Post stepping in and enforcing addressing rules in the early 40's, villages could basically number their own buildings as they wished. 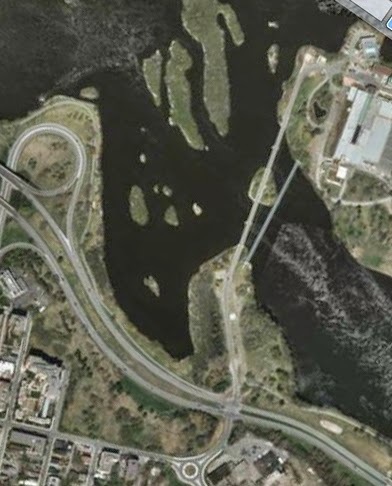 So Westboro ignored the portion of Richmond Road to the east, which also had a 9 & 11 Richmond Road just east of Island Park Drive, in the village of what was known as "Ottawa West". Confusing to say the least). showing Matt's Place at 9 Richmond. However, the momentum of west Ottawa's growth shifted around this time, as the depression settled in, and finances became strained for all. Due to the stone cold real estate market in Ottawa, with new home construction stagnant, records indicate that the Larkins had to make a deal with the Dowlings, the mortgage-holders from back in 1916, and the house was sold to the Dowlings for the price of the mortgage balances, taxes and insurance owing (a total of $3,700). 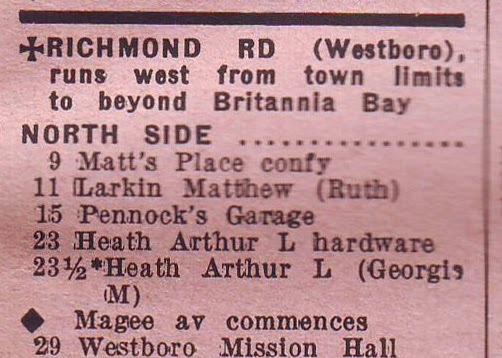 However, the Larkins continued to reside in the home, and operate Matt's Place for several more years. that existed next to the 1919 front addition. 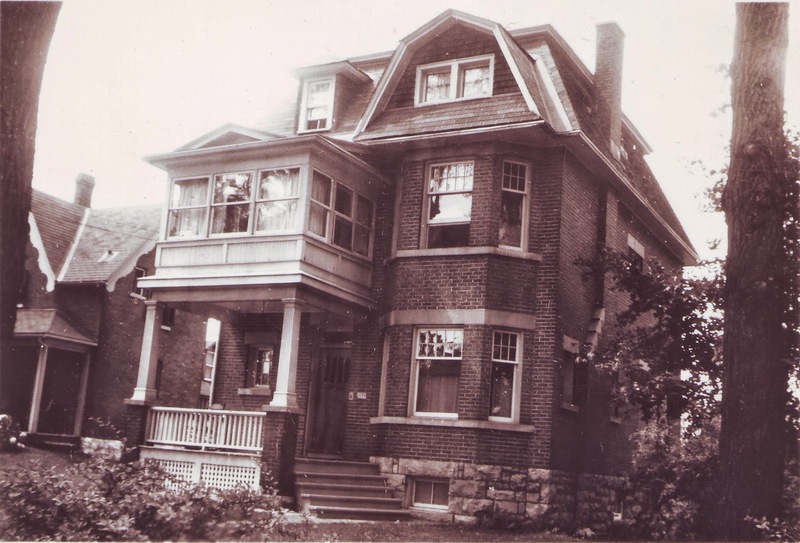 Sometime in December 1940 or very early 1941, the Larkins moved out of the house. As many of the kids had married and moved out, William and Mary moved to a smaller home in Ottawa. George and Mary Monsour, who had just married in 1939, moved in as the new tenants of the building. The Monsours continued operating the business, but gave it a new name: the Westboro Confectionery. The Monsour's daughter Carolyn was born soon after, and so many years later recalled for me the details of the layout of the house. The ground floor was divided in two halves. The west half was the living and dining room for the residence (this would be the bar area of Whisper's today). The east half was entered through a door on the side of the small front addition. The Monsours operated a long lunch counter along the east wall of the store (where the huge TV screen now hangs), where they served burgers, hot dogs and fries to hungry customers. On the left side of the store portion was a long wall where they sold grocery items. The front window was filled with fruit, vegetables and penny candies. 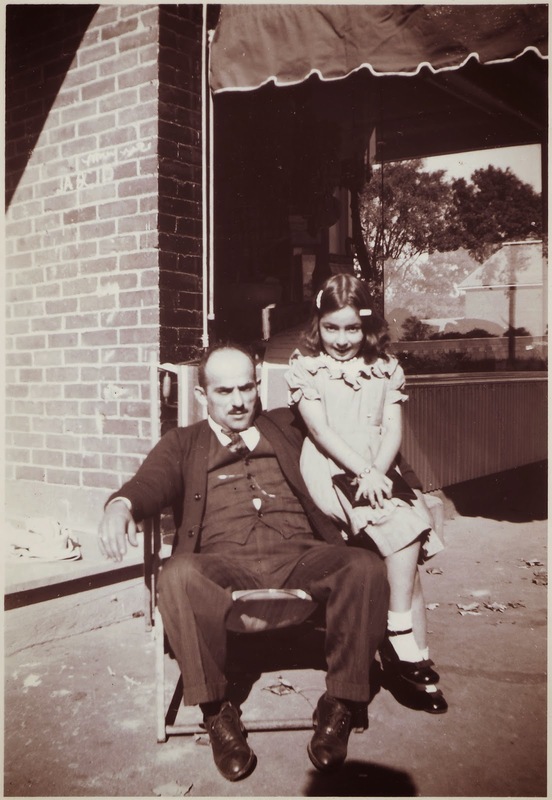 Carolyn recalled that her Dad was very generous with the neighbourhood children, giving the children free treats when they came to the shop with their parents, under the adage that "if you are good to the children, it will make the parents come back to the store". The staircase to upstairs was in the same location it is now, and upstairs were the four bedrooms, which Carolyn lamented not having taken the opportunity to have a nostalgic look at when lunching at Whispers a few years ago (renovations within the last few years has now opened up the upstairs as additional restaurant space - very cozily done too, I might add). 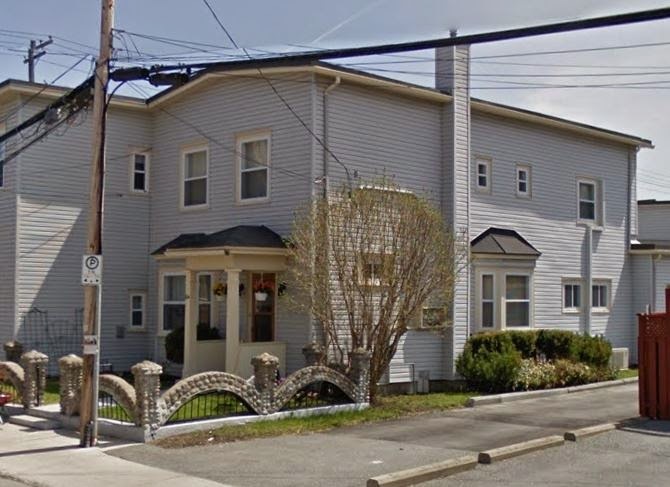 In 1942, with the new post office requirements, the store was given the number it still has today, #249 Richmond Road (the residence portion was given #251). The Monsours lived upstairs, and for a while had Mrs Monsour's parents living with them as well. 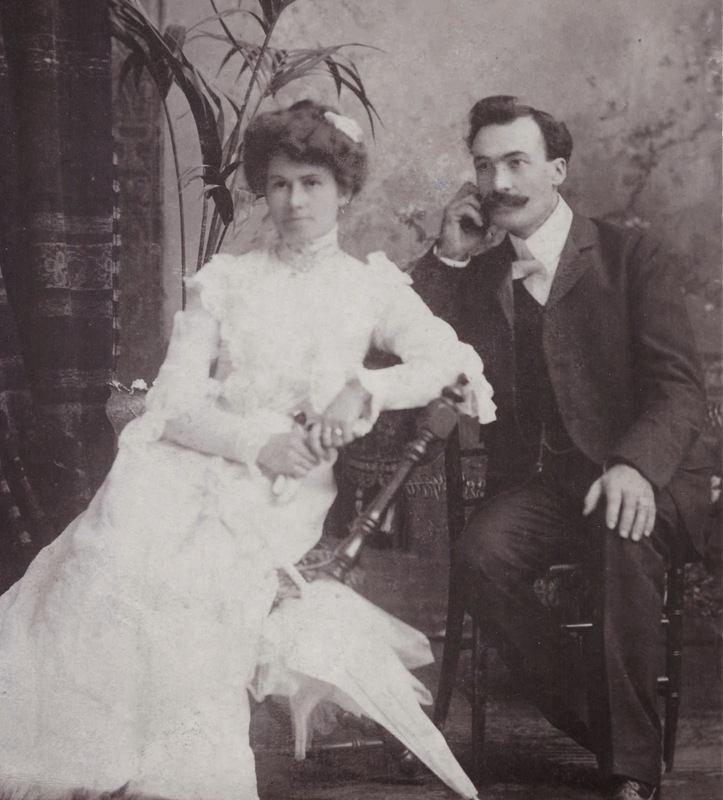 After a couple of years, George Monsour purchased the property outright from the estate of Bessie Dowling, who had died in 1939. The Monsours paid $2,700 on January 19th, 1943. At left is one of the few published advetisements taken out by the Monsours. between Athlone (at left) and Tweedsmuir. Below are some great photos that Carolyn Monsour so generously shared with me. 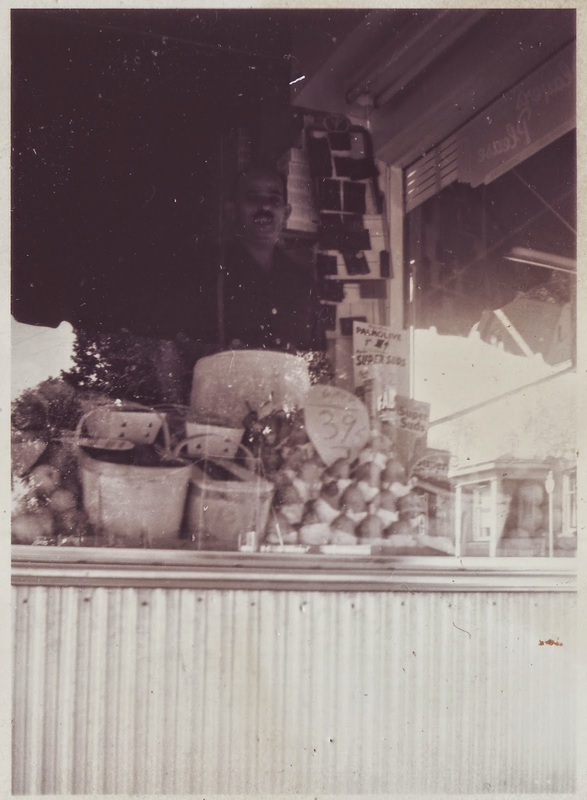 Each photo shows the front of the Westboro Confectionery, and a couple even have Mr. George Monsour as well. 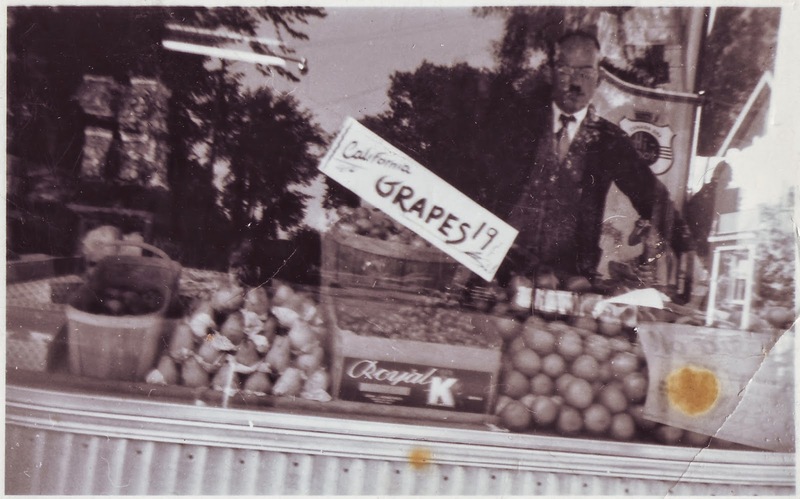 outside their store, mid-late 1940s. The Monsours continued to operate the Westboro Confectionery until the late 1950's. 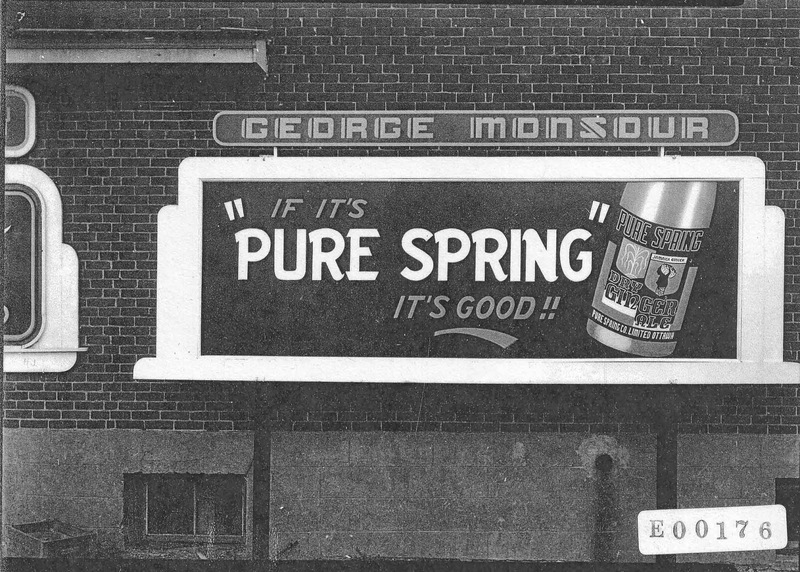 George Monsour began to feel unwell, and so in 1958 the family decided to lease out the business and residence. Sadly, George passed away a short time later in August of 1961. 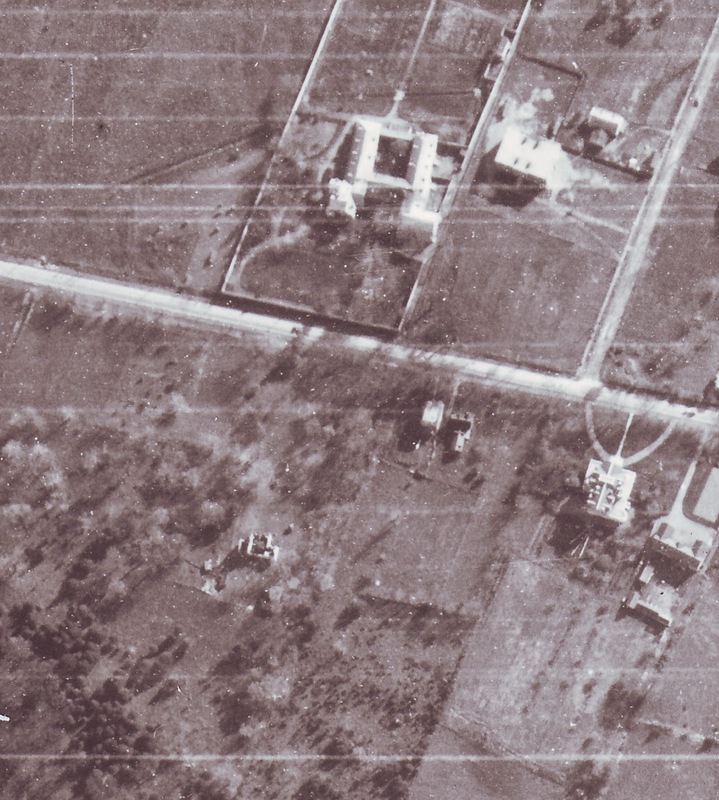 On October 1st, 1958, the Monsours leased the property to Rizk (Ray) and Joseph Naufal. It was a 10-year lease, with rent at $250/month for the first year and $275/month for years two through nine. The rent was split $150/month for the shop (which increased to $175/month after the first year), plus $100/month for the residence portion of the house. The Naufals moved in upstairs, and kept the name Westboro Confectionery. In July of 1968, Mary Monsour was listed as having sold the business to Helen Mains for $34,000. Mains immediately leased out the building to a Muriel Morrison, commencing December 1st on a 5-year lease at $450 per month to operate a "restaurant and coffee bar", but with the curious restriction: "...and the premises known as 251 Richmond will not during the term be at any time used for any other purpose than that of five rental units". This indicates that the residential living space upstairs and on the west side of the main floor was (or at least was intended to be) rented out in rooming-house style. Morrison got out of the lease after six months (for unknown reasons) and starting June 1st, 1969, the premises were rented to Hal B. Ellis, who opened the "Ellis Coffee Bar". The four-and-a-half year lease was for $350 per month. 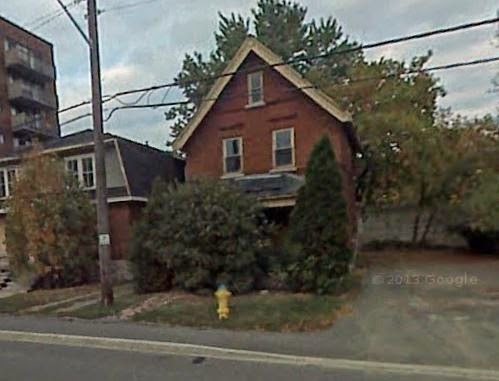 In May of 1972 Helen Mains, who by this time had moved to St. Catharines, sold the building to Rui De Lima and Emircio Garcia for $55,000. 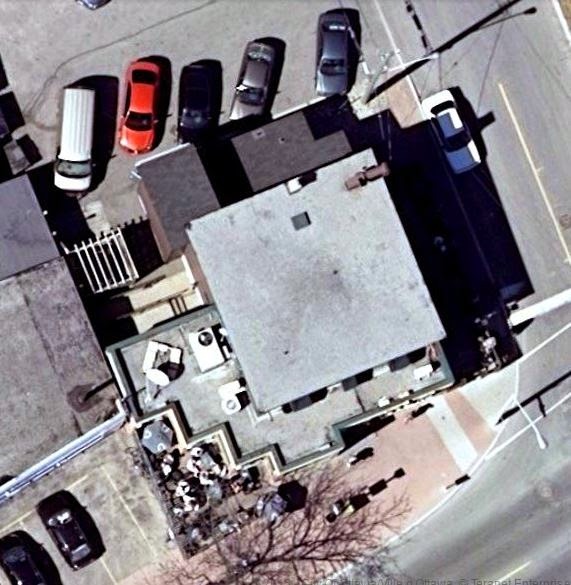 The pair had recently acquired the building next door at 255 Richmond and opened the Lusitania Auto Body Shop in 1970. 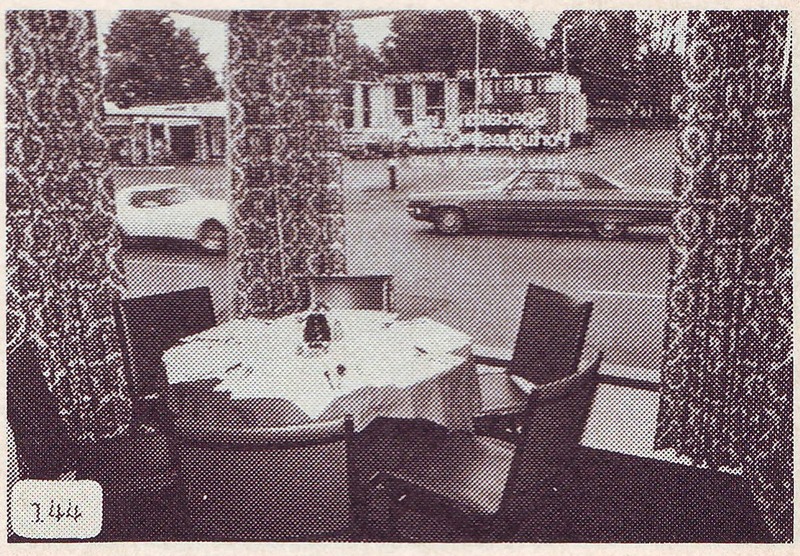 The Ellis Coffee Bar continued to operate through most of the 1970s. I could track down nothing on Ellis or the Coffee Bar. 1975 was the last year that occupants were listed as residing in the house. By 1977, the main floor was vacant as well. 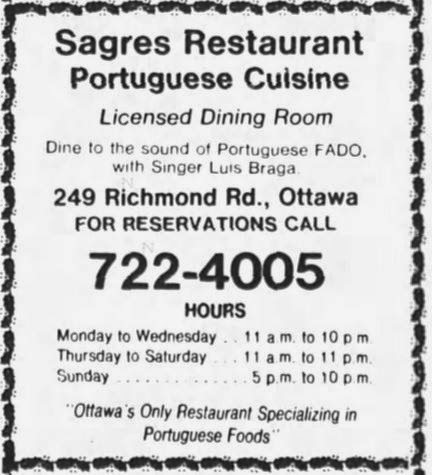 It was in early 1978 that De Lima and Garcia opened Sagres Restaurant, apparently Ottawa's first restaurant to specialize in Portugese food. Sagres continued to operate until closing sometime in either late 1980 or early 1981. 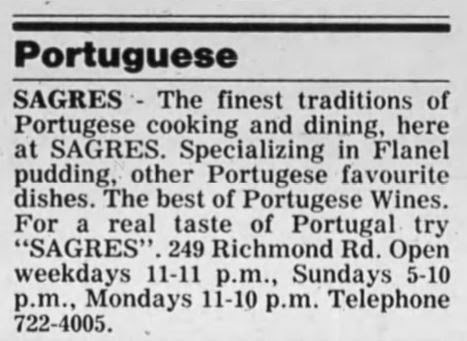 The business (under the name Sagres Restaurant Inc.) was purchased by Mike Kelly in July of 1981 for $75,000 and the restaurant re-opened as "Whispers". Don Cogan brought in a co-owner in November of 2008 when long-time staff member Stacy Rennick bought in to Whispers. 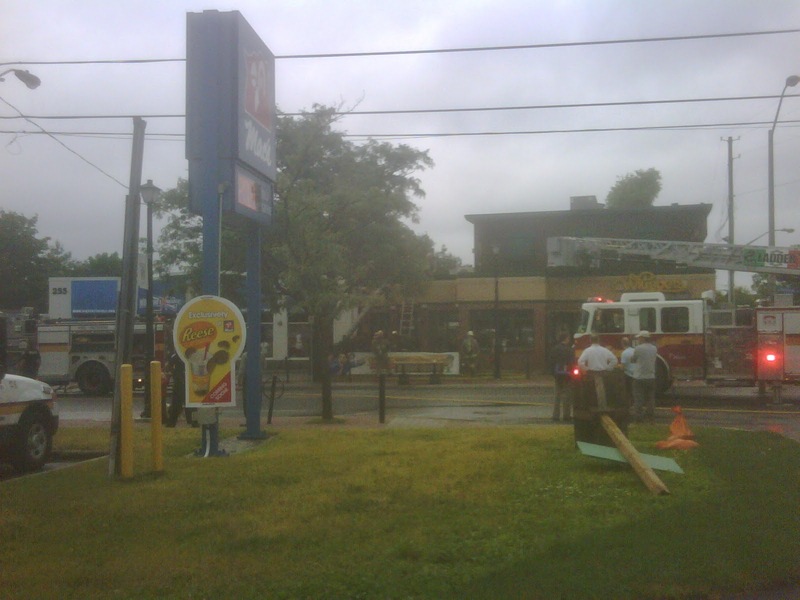 On June 24th, 2011, fans of Whispers got a scare when fire crews were called to the restaurant around 8 in the morning. I came down Tweedsmuir that morning, and saw that Richmond Road was closed off due to a fire - at Whispers! Luckily it was caught early enough, and was contained to the roof and an upper floor wall. The cause of the fire was attributed to some neon lights that had recently been repaired. morning air, soon after the fire trucks had arrived on scene. 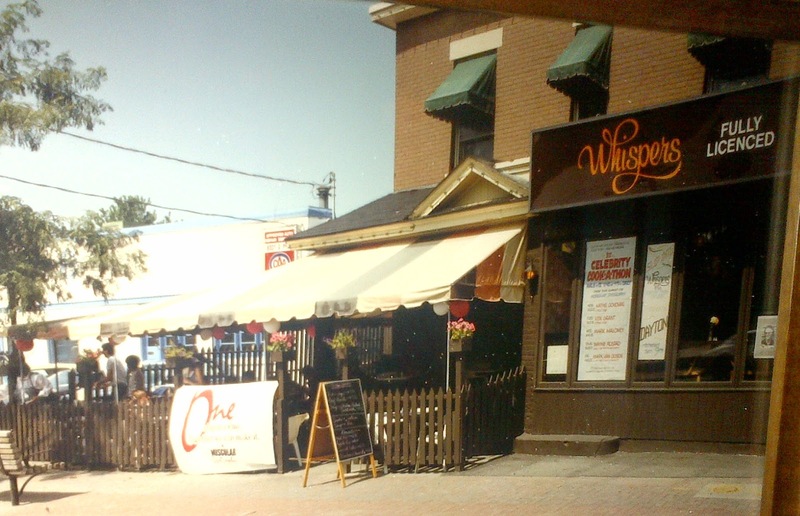 Whispers is entrenched as hub of the community - a place not only where people meet, but where events like book launches and concerts are held; where a hockey team can find a sponsor; a place, as one reviewer on Yelp said "as close as you're probably going to get to Cheers, the notorious Boston bar, in Ottawa". Even though over time the usage of the building has changed, the common thread through the years has been its tie-in to the neighbourhood. I love the fact that Carolyn Monsour shared a story about being recognized from the Westboro Confectionery last year by a former Tweedsmuir Avenue resident - impressive as the Monsours had left the store 57 years ago in 1958. I love the fact that the Larkin family still gets together on most St. Patrick's Days, and has a drink inside the home that their family patriarch William Larkin built over 100 years ago. 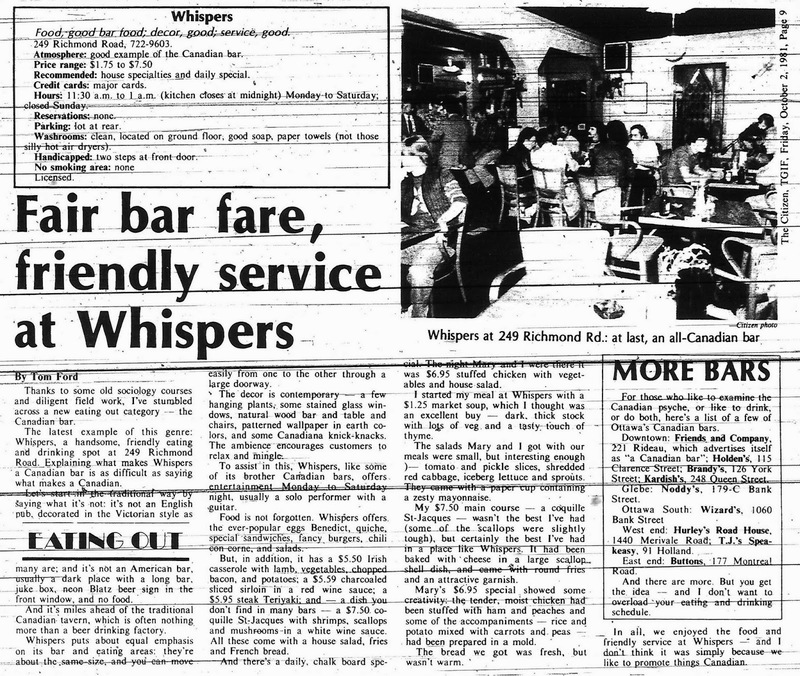 And I love the fact that Whispers is still going strong, despite the changing neighbourhood, increased costs, higher taxes, increased competition, and all the other stuff that in many urban centres has killed off the good old fashioned neighbourhood pub. Special thanks to Dan Larkin, Pat Larkin and Carolyn Monsour for all their help in sharing photographs, stories and memories of 249 Richmond Road. This week, I posted a photo of my grandfather Ted Sauve on the Mechanicsville facebook page, a busy and well loved page that features dozens of long-time Mechanicsville residents chatting about the old days. There are even quite a few members of a certain age group that you wouldn't necessarily expect to be posting on facebook group pages. But thankfully they are, and within minutes of posting a photo and caption about my grandfather's 1942 hockey team, I had replies from a couple of people who knew him. 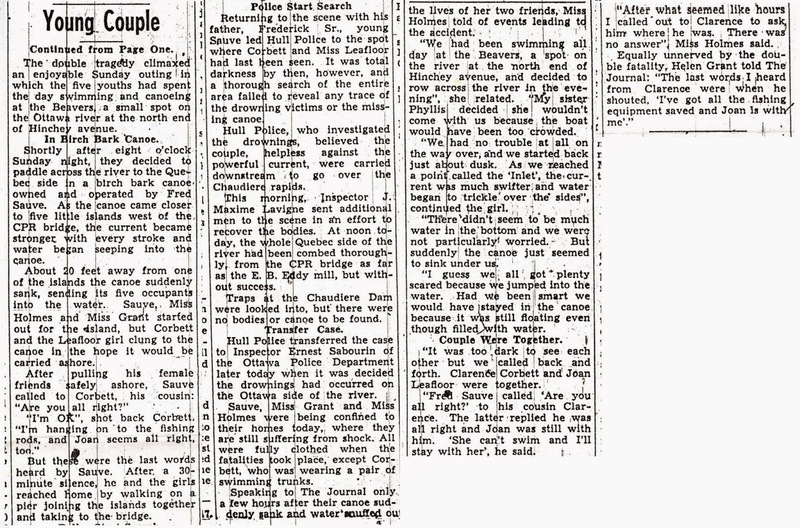 One even brought up the story that is well-told within our family, and which was a fairly big story in the area back in 1947. 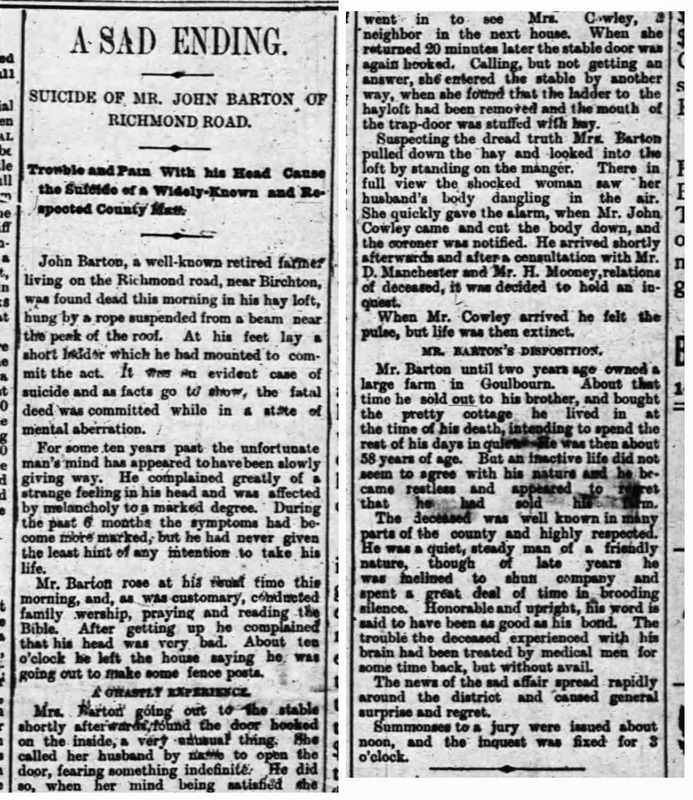 The conversation prompted me to dig out the copies of newspaper articles I had found for my grandparents about 15 years ago, when I tackled the microfilm reels at the public library with a vague year and month. 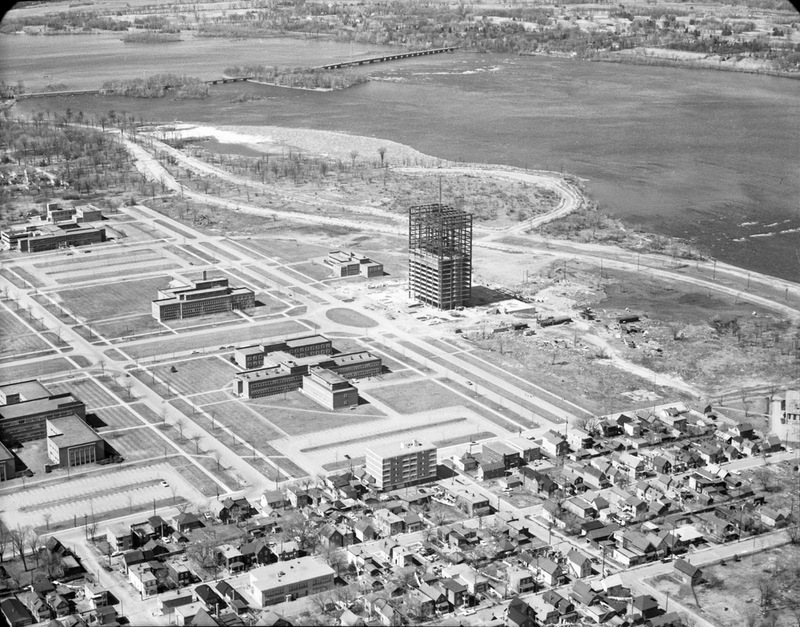 While this story is sadly far from being the only one of its kind in Ottawa's history, it was one that really did touch the residents of west Ottawa and especially Mechanicsville back in 1947. And for my grandfather it was a tragic tale in which he lost his 19-year old cousin with whom he was quite close, but luckily not only survived himself, but helped save two of his companions on that terrible day. My grandfather will come up a lot in this blog in future posts I am sure. He was a fixture of the Mechanicsville and Champlain Park communities, was a third-generation railway man, and his great-grandfather was one of Mechanicsville's first residents. He was also someone I respected immensely and had a million great stories about the 1930s and 40s in the neighbourhood. I know a lot of the reason I love history so much is because of him. Since I have the ability to choose any topic at all for the blog, I'd like to share this story that was such a pivotal event in his life. 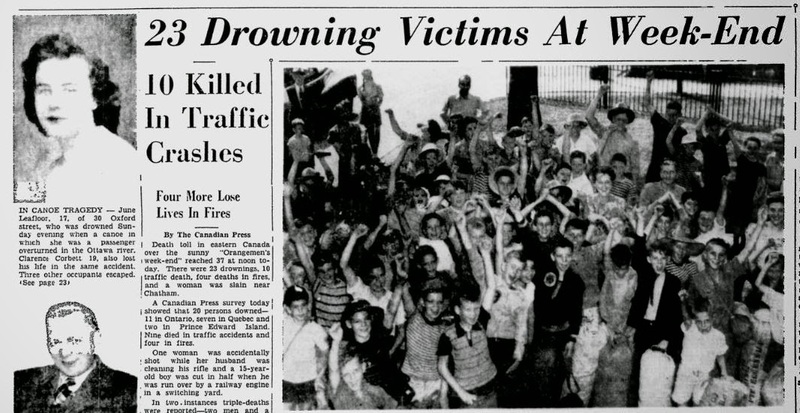 The accident occurred on Sunday July 13th, 1947, a little after 8 p.m. My grandfather Ted Sauve, then of 83 Carruthers Avenue, his cousin Clarence Corbett, and three female friends June Leafloor, Teresa Holmes and Helen Grant, all between the ages of 17 and 20, had spent the afternoon and evening swimming and canoeing around the spot which was informally known as "The Beavers". 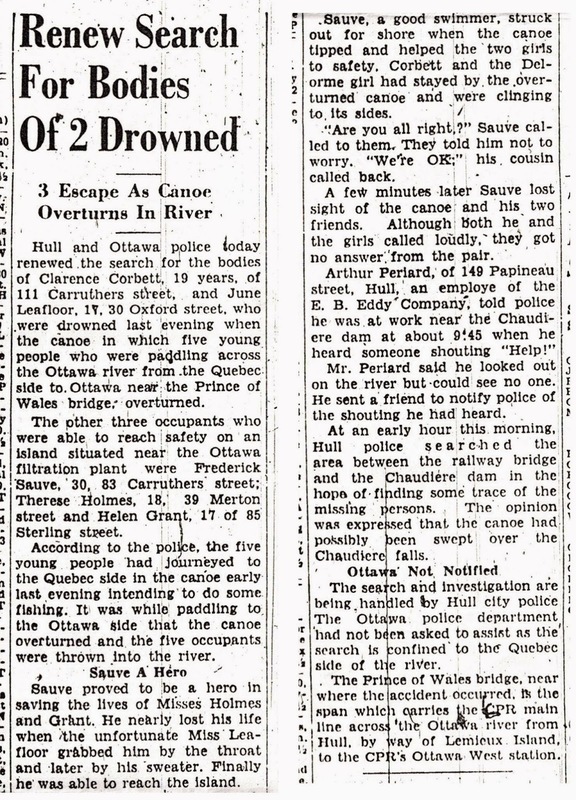 As the newspaper articles below will state, the canoe began to sink and the group panicked. My grandfather always mentioned that Clarence was the best swimmer of the bunch, but he had stayed with June Leafloor, who was unable to swim. The pair drowned likely due to the strong undercurrents in the area that pulled them under quickly. June's body was found a few days later, but Clarence was never found. Forward, Hinchey and Carruthers running north to it (now only Forward does). likely occurred just at the top and center of this photograph. 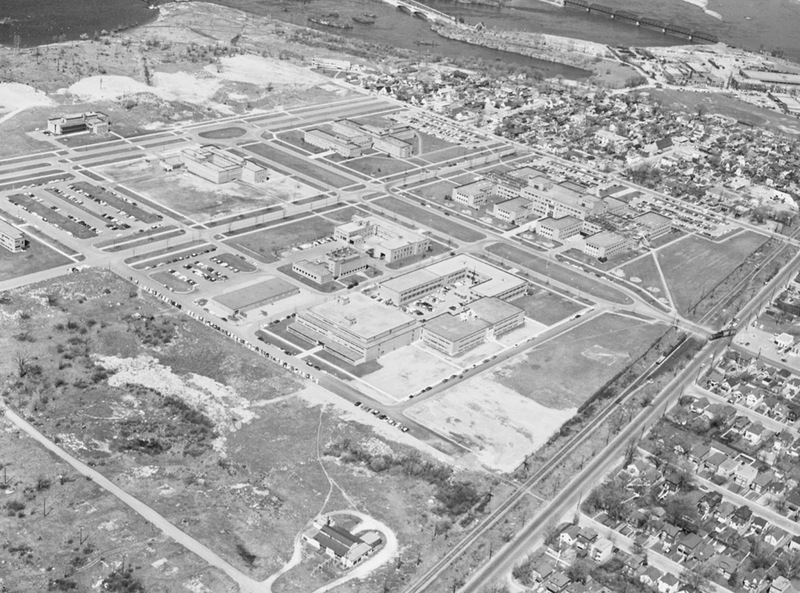 the NCC prepared the area for the River Parkway in the early 1960s. with an incredible 23 victims in all that very weekend.